The Krakow Salt Mine as a tourist attraction? Yep, it sure is.... And a big one. 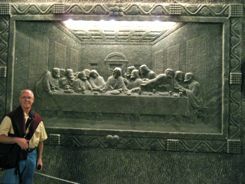 Because through the years, the salt miners carved salt sculptures. Sculptures and scenes that are amazing to see. 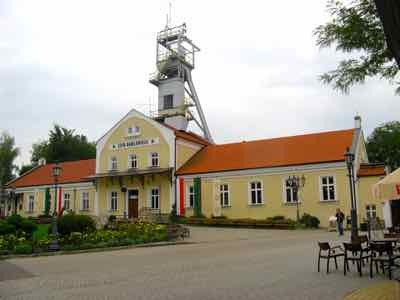 The mine opened in the 13th century, and produced salt until 2007. With all the rooms and sculptures it became a National Historic Monument of Poland. 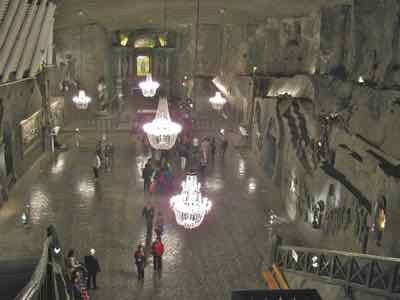 Actually the salt mine is at Wieliczka about 6 miles (10 km) from Krakow. Be prepared for cool temperatures inside the mine.... it's 14 C or about 57 F.
Wear comfortable shoes too; there are about 2 km (1.25 miles) of tunnels to walk between galleries and exhibits. 380 of them for starters. You begin the tour at about 64 meters (210 feet) below ground level. You'll go down about 700 stairs in total (according to their literature) and end up 135 meters (440 feet) underground before you head back up! Don't worry too much about the stairs... you have to take them down, but they whisk you back to the top in a "typical" miners elevator. I have to admit... it's a bit of a thrill all by itself! You must tour the mine with a guide, and you really wouldn't want to tour it on your own... you'd get lost for sure. We even thought we might get lost on the walk out! 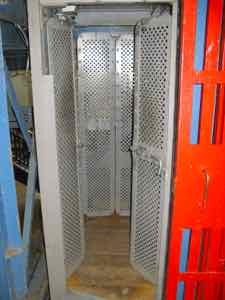 There is no need to make a reservation for the regular tour. People with disabilities can ride the lift down and take a shorter tour of the mines. You do need to make a reservation for this. The basic tour takes about two hours. Plan on spending another hour if you want to see the Krakow Salt Mine Museum. You'll have a choice of whether to go on to the museum or not when you get done with the Tourist Route in the mine. If you want to take pictures inside the mine, you have to pay a photography fee. Go ahead... you'll want to take pictures. They do give you a couple of rest stops, and their are toilets available. And at the end of the Tourist Route there is a restaurant so you can claim you ate underground too! You can sign up for a tour of the Krakow Salt Mine at your hotel, but it is easy enough to do on your own. Transportation to the mine is easy. Local trains go from Krakow to Wieliczka Rynek train station several times a day. You can catch a local bus from the city. The 304 line will get you there. For about the same price, you can catch a mini-bus near the Main Railway Station or the Main Post Office. Just ask the driver to make sure you're going to the Krakow Salt Mine at Wieliczka... or if you can't pronounce that, just say Krakow Salt Mine. They'll drop you off right in front of the entrance. 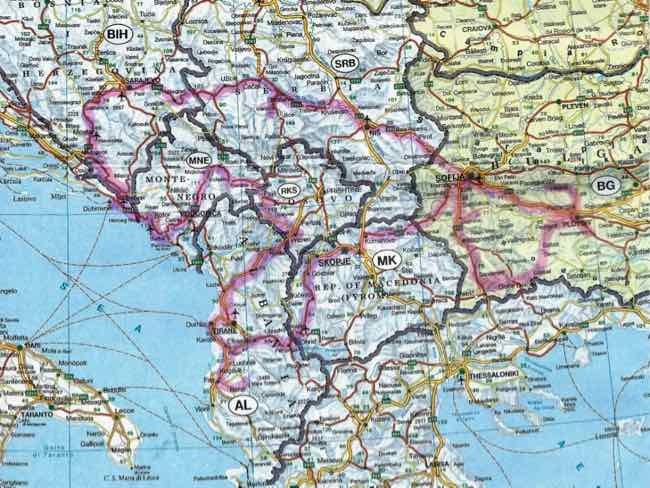 It's easy to catch the mini-bus back to Krakow too. You can sign up for tours in several languages at the ticket booth. The website for the mine actually has a timetable for when foreign language (other than Polish) tours are offered throughout the day, so you can plan ahead for when to arrive to get the tour in your language. Ticket prices include a fee for the services of these foreign language guides. These mines at Wieliczka were active salt mines for centuries.... now the amazing sculptures that the miners made over the centuries are reserved for tourists.